Dr. Ronda’s examples: Alarm didn’t wake me. I woke up late with only ½ hour max to get ready and drive 20 minutes away but I did it as a tiny sacrifice of going without my wake-up tea. 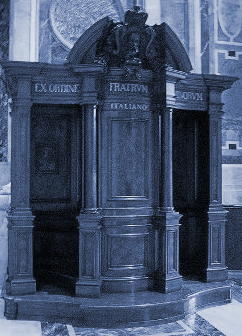 Regular confessions are from 4 PM – 4:45 PM on Saturdays. Since the Church is 20 minutes away I thought of asking the priest, who is also a good friend, to hear my confession after the morning Mass. I hesitated because I feel uneasy asking any “father figure” for favors. Then I thought that if the priest chooses to hear confessions only once a week it is good for him to be eager to hear confessions when people want to go during the week. It was a sacrifice to overcome my hesitancy in the fear of annoying the priest. As it turned out he was as pleasant as can be about it. I felt very happy because I find it awful when lay people are afraid of the priest concerning asking him to do things that are part of his role. I called someone who wrote a real letter for Christmas vs. one of the letters sent to 500 friends and relatives. (I see that writing these each year is good for families to do, but sending them to people that you never contact between one Christmas and the next who hasn’t seen you or talked to you on the phone or e-mailed you for 10 years doesn’t seem to require a personal answer.) I tried to make bread with my daughter’s new bread-maker even though I was afraid of lousing it up since the directions disappeared with Christmas wrap. The sacrifice is to tackle tech stuff even if I might feel stupid. I called a friend who misses me since I will be gone for awhile from being near to her. I took a little walk even though I don’t like exercise that much because it’s good for me. I wrote a letter of amends to someone who might be angry at me. Prayer: Thank you, Holy Spirit, for inspiring me to put this theme of making sacrifices into the Way of Love: Step by Step. I dislike lazy self-centeredness in others, so I should be willing to make sacrifices myself without lethargy or depressed feelings. Can you remind me when this week is over?